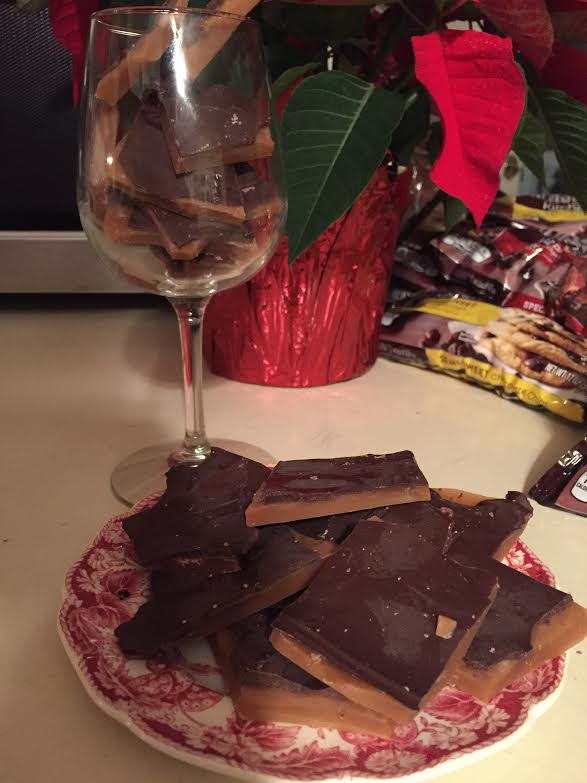 Toffee for Christmas is a favorite with everyone. This is my most-requested candy recipe and I have gladly shared it with friends, family, and anyone else who has asked. 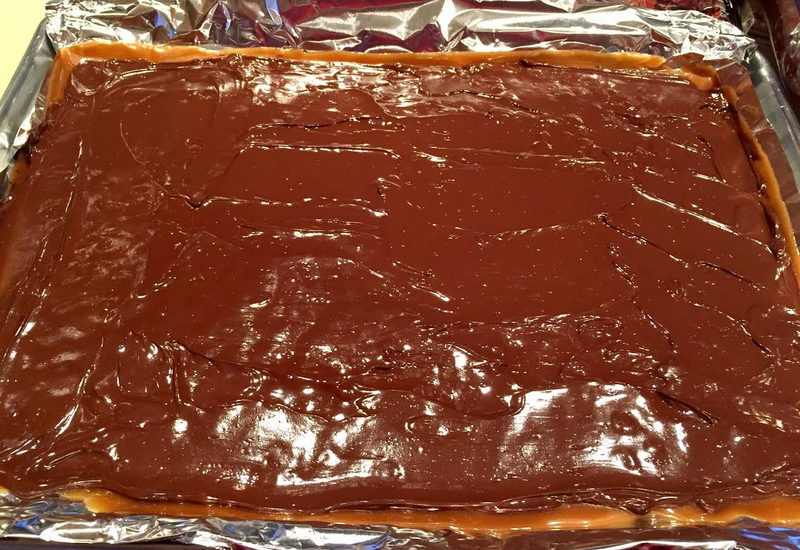 I loved the toffee sold by Warfel’s Candy at the Dayton Farmers Market in Rockingham County so years ago began searching for a recipe that would duplicate it. Sure enough, I found exactly what I wanted in the Better Homes & Gardens Cook Book (entire recipe is at the end of this post). I made a double batch yesterday so thought I would share it for those who would like to make some for their holiday festivities. First thing is to butter the sides of the sauce pan, then put butter in pan and melt over low heat. After the butter melts, add sugar, water, and corn syrup. It will have this bright yellow color. 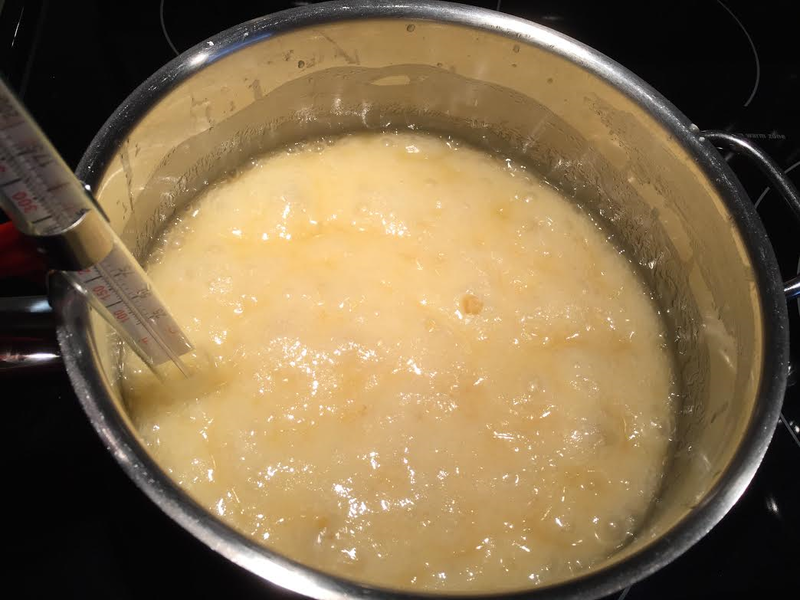 Cook and stir over medium-high heat until mixtures boils. Clip a candy thermometer to side of pan and reduce heat to medium as candy continues to boil at a moderate, steady rate. As it cooks, the color will become golden-brown. Keep stirring, to prevent scorching, until thermometer registers 280 degrees F. Watch carefully and stir continuously at this point because it will burn easily. When the thermometer reaches 290, the candy mixture will be a deep golden-brown. Remove from burner and, working quickly because it sets up fast, spread onto a cookie sheet that has been covered in aluminum foil. You don’t need to butter the foil because the toffee will not stick to it. 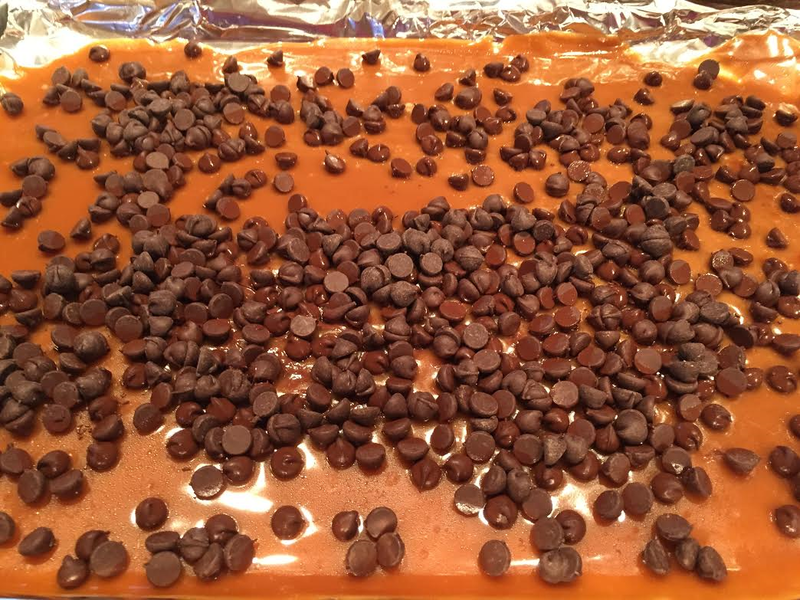 Let toffee set for a couple of minutes, and then cover with chocolate chips. Allow them to soften for 2 minutes, then spread evenly over candy. After spreading the chocolate, it will take a couple of hours for it to harden to the point where you can break the toffee into pieces. It’s just a random process … pick a corner and begin breaking it. If you want to add toasted pecans or almonds to the top, do it immediately after spreading the chocolate. I used to add the nuts but it is so good without them that now I just make the plain. The toffee stays fresh, if stored in an air-tight container, for several weeks and makes yummy gifts that are popular with just about everyone. Happy candy making, and Merry Christmas! 1. Line a 15x10x1-inch baking pan with foil, extending foil over edges of pan. Set aside. 2. Butter the sides of a 2-quart heavy saucepan. 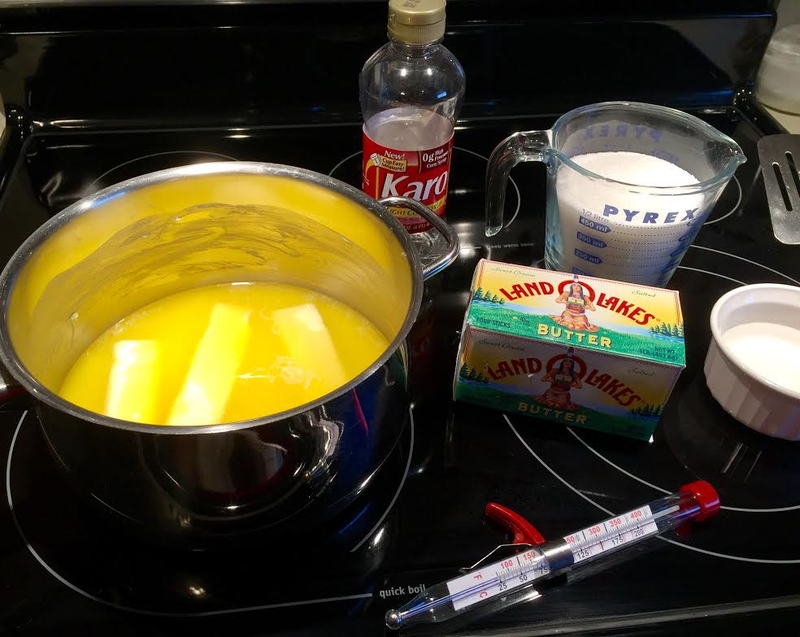 In saucepan melt butter; add sugar, water, and corn syrup. Cook and stir over medium-high heat until mixture boils. 3. Clip a candy thermometer to side of pan. 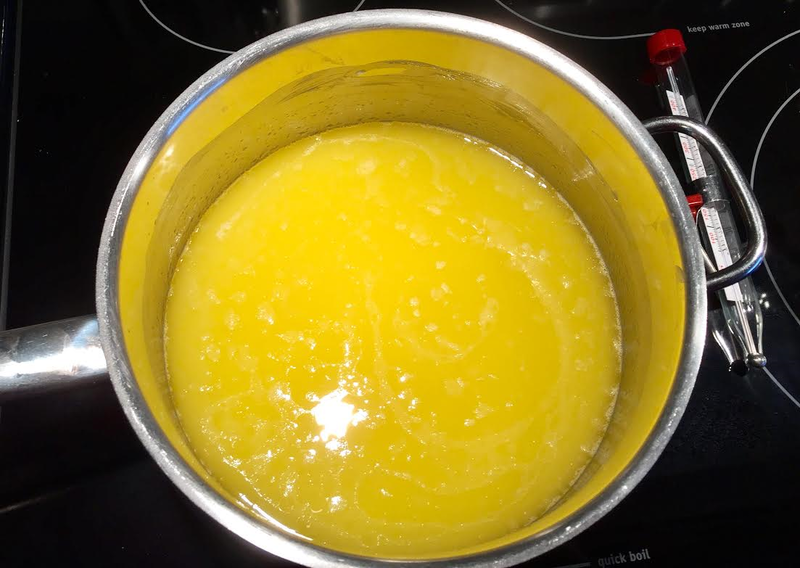 Reduce heat to medium; continue boiling at a moderate, steady rate, stirring frequently, until thermometer registers 290 degrees F, soft-crack stage (about 15 minutes). Adjust heat as necessary to maintain a steady boil. Watch carefully after 280 degrees F to prevent scorching. 4. Remove saucepan from heat; remove thermometer. 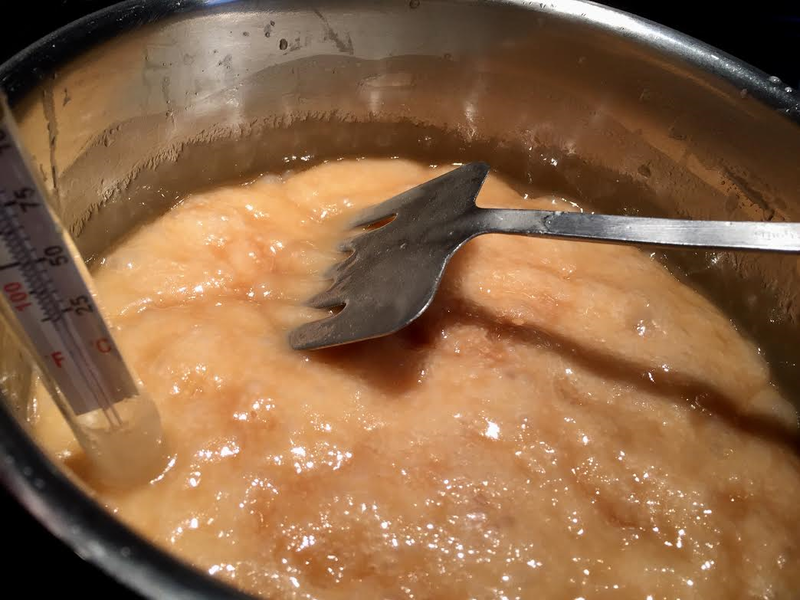 Pour candy into the prepared pan, spreading quickly. 5. Let toffee stand about 2 minutes or until set, then sprinkle with chocolate chips. Let stand 1-2 minutes. When chocolate has softened, spread over candy. Sprinkle with nuts (optional). Let stand until firm. When firm, use foil to lift it out of pan; break into pieces. Store tightly covered for up to 3 weeks. Note: Can easily be doubled. Do not triple the batch because candy will set up too fast.